Probability is simply "How likely something is to happen" and using this, we can find the likelihood or percentage of that something happening.Concepts of probability have been around for thousands of years, but probability theory did not arise as a branch of mathematics until the mid-seventeenth century. You can use probability to find the odds of a coin toss being a certain result or finding the odds of a certain sum being rolled or even finding the odds of having a certain monster in your hand which i am going to explain today. we can use this formula to find the probability of something happening for anything from dice to cards to spinning a wheel. Odds of getting a certain coin toss permutations which is the odds of something happen in any order. 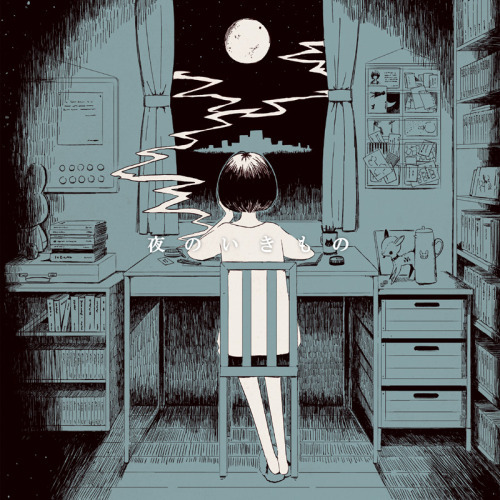 Does it matter how many cards i have in the deck? Even though the percent difference is small, your odds aren't great to begin with hence why people think "the less cards in your deck, the better the odds" because your are decreasing the total number of cards in the deck and increase the odds of a better card. Toss a coin 3 times. If all 3 results are Heads, destroy all monsters on your opponent's side of the field. If all 3 results are Tails, destroy all monsters on your side of the field. You can only activate this effect once per turn, during your Main Phase. 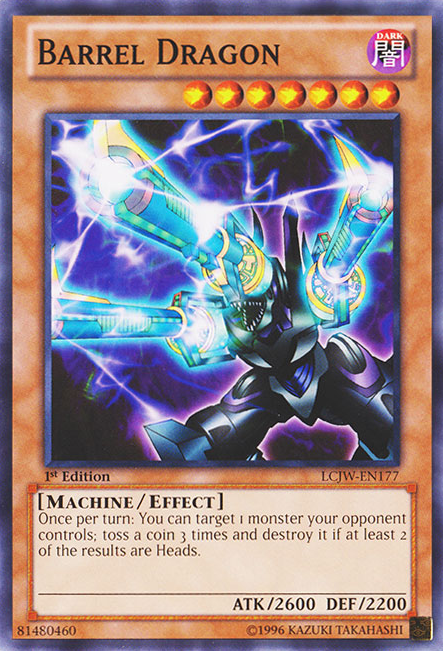 Suppose you use Sand Gambler's effect to destroy 5 of your opponent's monsters which you will need 3 coin toss that will result in all 3 being heads. I am going to show you using as probability tree. 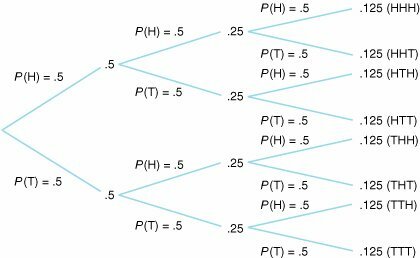 Probability Tree is basically a diagram used to find the odds of something by showing a map of the results. Ever branch is a probability of something happening thus we have 3 sections of branches for tossing a coin three times. (1/2) *(1/2)*(1/2)=( 1/8 ) which is 12.5% odds of getting result of all 3 being heads. Once per turn: You can target 1 monster your opponent controls; toss a coin 3 times and destroy it if at least 2 of the results are Heads. Now using the probability tree for visual concept to find the odds of getting a result with at least 2 heads which will be using the same tree form before. .125+.125+.125+.125=.5 or 50% of the result of having 2 heads or more for using barrel dragon's effect. Suppose i wanted to use Lucky Straight's effect to roll a dice two times and get a total result of exactly 7. 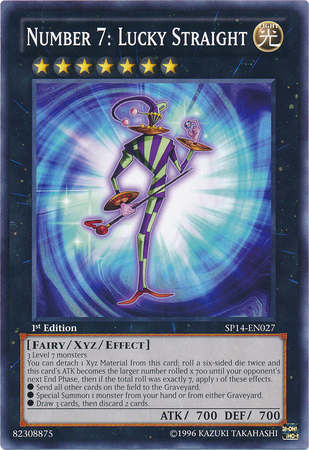 You can detach 1 Xyz Material from this card; roll a six-sided die twice and this card's ATK becomes the larger number rolled × 700 until your opponent's next End Phase, then if the total roll was exactly 7, apply 1 of these effects. ● Send all other cards on the field to the Graveyard. ● Special Summon 1 monster from your hand or from either Graveyard. I can set up a table of the odds of rolling a total sum of 7. I now take the total of times i can get a result of 7 and divivded over the number of possible rolls. total number of rolling being sum of 7/total number of events=6/36=.1666667 or 16.7% of getting a sum of 7 from Lucky Straight's effect. Believe or not, this is much simple than it seems. Suppose i had a 40 card deck with all monsters(different builds can change it and there is more than 1 type of Exodia builds so i am showing it just a practical results.). Suppose that Player 1 and Player 2 both used the same exact deck with all monsters and it's Player 1's Opening Turn. remember its :total number of success/total number of cards to find probability. (5 pieces of exodia left in deck/40 cards left)*(4 pieces of exodia left in deck/39 cards left)*(3 pieces of exodia left in deck/38 cards left)*(2 pieces of exodia left in deck/37 cards left)*(35 card left in deck/36 cards left)*(1 piece of exodia left/35 cards left in deck)*6 different ways you can not draw exodia piece=1:09668 chance of getting exodia for Player 2. Since Player 2 drew a card from his draw phase, his odds are better than Player 1's odds which i just proved.